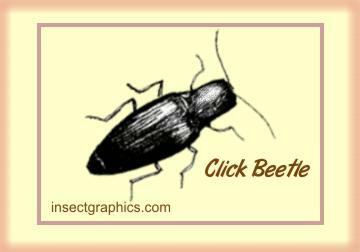 There are thousands of species of click beetles, all members of the Elateridae family. They are sometimes called Elater Beetles, Skip Jacks, Snapping Beetles or Spring Beetles. Most are small, brown, flattened insects, � to 1� long, but some are larger, and may be a metallic green color. If they should land on their backs, they are unable to right themselves with their short legs. Instead, they have a hinge that enables them to arch their backs, and when they suddenly straighten out, a spine-and-groove mechanism is activated, which shoots them into the air with a loud �click.� With luck, they turn themselves over in the air and land right-side-up. They also may try to deter predators by �clicking� when picked up, or by pretending to be dead. The adults of most species feed on leaves, some on nectar. Most are nocturnal, and they may gather around lights at night; sometimes they enter homes. The larva of the click beetle is a wireworm which feeds on the roots of plants. The larvae live in the soil for as long as 2-3 years; some species are serious pests of corn and other grains.